Tesla won’t just want to sell solar through SolarCity—it’ll want to sell batteries too. When Elon Musk unveiled his intent to acquire the solar installer SolarCity, many observers and investors balked. Some have wondered if the deal amounts to nothing more than a bailout for the Musk-supported SolarCity at Tesla’s expense. After all, what does a car company have to do with putting modules on people’s roofs? The business models are very different. Here’s how MJ Shiao, GTM Research’s director of solar, captured that skepticism shortly after the announcement: “The sales pitches for a three- to five-year lease or loan on a premium car versus a 10- to 20-year lease or loan on energy services don't match,” he said. “Is the average person going to walk into the store expecting to buy one and then suddenly get upsold on the other?" A business model based on the combined solar-plus-storage-plus-luxury-EV package might find more customers than an electric Lear jet startup, but not by much. And although SolarCity will get a publicity boost from the association with Tesla -- and a physical presence in its 190 retail stores -- it’s harder to see how SolarCity benefits Tesla financially right away. If both companies’ investors approve the purchase (and there's reason to think they will), corporate leadership will have to show that they can chase the long-term mission of forging a comprehensive sustainable energy company without burning too much cash in the near term. Luckily for them, Tesla’s not just a carmaker. Its energy division, which manufactures the Powerwall battery, makes for a much more felicitous pairing with a solar manufacturer and installer. The successful merging of the companies will depend on quickly monetizing the additional revenues from selling both solar generation and battery packs under the same roof. The home-use options from SolarCity and Tesla Energy carry more fame, but let’s start with their larger-scale offerings, which are already afoot. Tesla teamed up with SolarCity last year for a first-of-a-kind 13-megawatt solar/13-megawatt storage plant in Kauai, Hawaii. Long term, this sort of project is where most of Tesla’s batteries will end up. 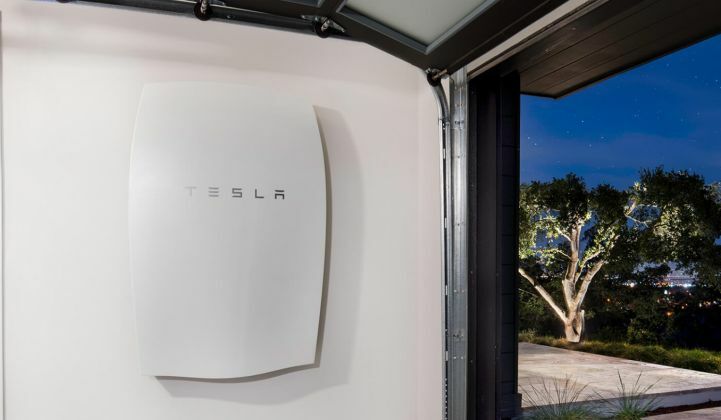 “We expect that 80 if not 90 percent of all the stationary storage we sell will be the Powerpack, not the Powerwall,” Musk said at the Edison Electric Institute convention in 2015. The Powerpack comes in 100-kilowatt-hour units that can stack for grid-scale applications like peak load management, backup power, demand response, reserve capacity and more. Many of these projects will get developed alongside utilities, and utilities like to minimize risk. Put simply, they’d rather have one entity to sue if things don’t turn out the way they’re supposed to. That’s what a unified Tesla-SolarCity would offer: a one-stop shop for utility-scale solar and storage. That streamlining of the customer relationship will help in the residential sector, too. Having one company to contract with and pay back for solar and storage makes things simpler for everyone involved; although, Manghani noted, that effect is hard to quantify. But SolarCity brings something else to the table: a captive and willing audience. SolarCity has served close to 300,000 customers across 27 states. That population has demonstrated a willingness to invest in new, clean energy technology. They also have more to gain than any other population segment from the addition of a home battery system. Working through that customer list and pitching Powerwalls hard and fast should be on the top of Tesla’s to-do list for day one of the unified company. The 6.4-kilowatt-hour Powerwall can provide backup power in case of a blackout, but in most cases batteries can’t compete with gas or diesel generators for backup use. What the Powerwall can do well is store rooftop solar generation for use when the customer desires. The pitch to existing solar customers goes further. Even if they live in a regulatory regime that rewards them for power they generate and don’t use, policy may change. Nevada demonstrated that risk last December, when the Public Utilities Commission slashed compensation for the solar power that residents pump into the grid, and applied it to everyone who had already sunk their money into a solar system. By letting solar customers consume more of what they produce, storage offers them a hedge against unfavorable shifts in the regulatory winds. Lastly, if a household has grid-connected solar modules on the roof, it means they also have an inverter installed to switch that DC current to AC. That removes another barrier and expense to adding energy storage. Tesla sells the Powerwall through a network of approved installers and resellers. With SolarCity, they can tap the latter's sales force, which has spent years honing the sales pitch for distributed energy systems. This could mean significant savings for Tesla, said Matt Roberts, executive director of the Energy Storage Association. "They're helping to eliminate those soft costs compared to a storage-only vendor who would try to do the same thing," Roberts said. "They would be starting effectively from scratch, driving around trying to figure out who has solar panels, when SolarCity can just open up the spreadsheet and go, 'Here's 5,000 potential customers, let's go call them. And hey, you're already SolarCity, so we can take 10 percent off.'" This market has a lot more room to grow. The share of residential solar installations that have energy storage is in the low single digits, Manghani said. The best economic cases for it lie in states with meager payback for surplus solar generation or expensive electricity, like Arizona, Hawaii, Nevada and, increasingly, California. Selling more batteries will bring in revenue in the short term. As demand for the batteries rises, Tesla can use economies of scale to reduce the price, which in turn makes it easier to sell the electric cars and storage systems. But there's an even bigger future revenue source at play here: distributed capacity. Once Tesla has access to a substantial population of homes with solar and storage -- not to mention the fleet of EVs -- it can aggregate small amounts of power from all these resources to sell. This combined asset can respond to peak demand, provide frequency regulation for the grid or even bid into capacity markets. This model is already coming into use in the form of virtual power plants -- they're not a traditional generation source, but they bring together enough electricity from multifarious sources to be useful. "The more of these nodes that they get out on the grid, the more capabilities are enabled," Roberts said. "Whether or not they're using them as a virtual power plant today, they're building the infrastructure for that in the future." SolarCity has been planning for this for a while now. It has been building that possibility into the hardware it deploys and the customer contracts it signs. And it has committed to sharing the revenues from aggregated grid services with the customers who participate. Looking ahead, the potential for future revenue could allow the vendor to discount the product upfront, helping get more storage out the door and creating a virtuous cycle. This won't be practicable for a while though -- as GTM's Eric Wesoff put it, changing the rules to allow this kind of distributed aggregation "will require upending the way regulated monopoly utilities have operated for going on a century." SolarCity was already working on this with Tesla batteries, so merging with Tesla won't change much. But the additional clout and bargaining power of the two companies combined will be an asset in guiding the policy negotiations needed to set up a market for distributed resources. Leveraging home solar and storage plus the fleet of EVs also gives them more to sell. None of these possibilities guarantee that Tesla will succeed. The company has a new Model 3 to roll out, a Gigafactory to finish constructing, and existing production targets to hit. Adding a solar company, with debts of its own, to the mix is not going to make any of those challenges easier. If the companies do come together and march toward positive cash flow, their success will advance more than their own stock value. Already, Tesla has grown public awareness of energy storage more than any other entity. It's hard to find a news story about storage geared toward a general audience that doesn't lead off with Elon Musk and the Powerwall. That fame creates space for all the other energy storage companies. And the acquisition will enable Tesla to bring that public attention to the combination of solar and storage. "It does make any kind of solar-plus-storage offering more mainstream than it is today," Manghani said. More lastingly, it gives legislators and regulators a point of reference when considering rules that could create new markets for storage. At worst, Tesla flounders under its own debt. At best, though, the company opens new markets for integrated clean energy services -- creating space for others to grow, too.